Looking for Maui timeshares resales? Check out our current timeshare resale listings below. We represent timeshare resale buyers and timeshare sellers, since 1993. We offer the best Hawaii timeshare resale properties on every island. Our Maui timeshare property selection offers something for everyone. Our timeshare resale listings change frequently so please check back often or let us know what you are looking for and we’ll do our best to find it for you! Ka’anapali Beach Club Maui is a Diamond Resorts property (formerly Embassy) located on the beach, just north of the Ka’anapali hotel district. The property is a good choice for upscale guests who want more than just a hotel unit. The 1 bedroom units will sleep up to 4 people. These large units are nicely furnished. All units are equipped with a wet-bar which includes a microwave. The property offers a free breakfast daily to all guests and a complimentary cocktail party nightly. Children of all ages will love the waterslide. Parents can also sign their children up for the children’s program. Fitness buffs will enjoy the health club and all guests will like the shops and restaurants. Our Ka’anapali Beach Club timeshare resales are very popular. 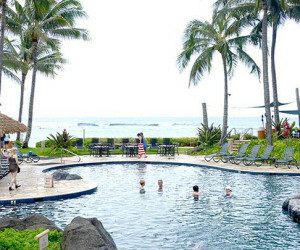 Kahana Beach Vacation Club is located in Lahaina, Maui in Hawaii. Kahana Beach Vacation Club is on a prime location on the beach in Kahana, and offers scenic views of Molokai and Lanai Islands. Studios and one bedroom units have views of the ocean and are near an outside swimming pool, barbecue grill, deck chairs on beach and activity desk. All units feature color cable TV/VCR, full size/fully equipped kitchens, ceiling fans, free parking, and more. Laundry facilities are on site. The resort is close to Lahaina and within 10 minutes of 5 championship golf courses. Kahana Falls offers the best of the island of Maui and all of its beauty. The island is filled with colorful gardens and plenty of opportunities to enjoy scuba diving, fishing, sailing, and snorkeling. To get an even better view of the splendor of Maui, take a helicopter ride. For the early riser, a morning trip to the top of Haleakala is breathtaking. If you enjoy staying close to the Kahana Falls resort, visit the old whaling town of Lahaina, where you’ll find history and beauty combined in one place. Kihei Akahi on Maui’s idyllic western shore of long, sandy beaches invites you to explore the best of Hawaii. Bask under an island sun on warm golden sand; swim in crystal-blue waters perfect for snorkeling and skin diving–you’ll find a world of wonder under the ocean waves. Take a day trip to explore the lush valleys of Maui, or experience the drama of Haleakala, a volcanic crater of stark and magnificent beauty. Relax on the lush island of Maui at The Kuleana Club. This oceanfront resort is native Hawaii at its finest. At the resort, you can take a dip in the outdoor pool, snorkel in the ocean, or play a set of tennis. Five tournament-quality golf courses are within a few miles of the resort. When nighttime comes, you can dine and dance at several restaurants and clubs within a couple of miles of the resort. Some of the finest beaches in Maui are within easy walking distance. In Lahaina, you’ll find historic sight-seeing attractions and shopping complexes. Marriott Maui Ocean Club is located on the beautiful sands of Ka’anapali Beach. Retreat in island style to one or two bedroom villas with fabulous amenities including separate living and dinning areas, a gourmet center, and private balcony. Marriott Maui Ocean Club Lahaina and Napili Villas are located on the beautiful sands of Ka’anapali Beach. Beach front units offer a comfortable and luxurious island style retreat with one or two bedrooms and fabulous amenities including separate living and dinning areas, a gourmet center, and private balcony. Maui Schooner is a contemporary oceanfront island resort on the Maui southwest shore. The comfortable one- and two-bedroom units offer fully-equipped kitchens complete with microwaves. Maui Schooner’s sprawling lawns lead to the tennis courts and the central courtyard where guests will find a pool, spa, and shuffleboard. Maui Sunset offers fun activities like scuba and snorkeling lessons (for a fee) and are only two of the special touches you’ll find there. At this beachfront resort, you can also enjoy an outdoor pool, hot tub, shuffleboard courts, and a nine-hole putting green. Four golf courses are close by. To help you plan your sight-seeing trip of this gorgeous island, Maui Sunset has a tourist information center. Kihei has the most state park beaches, with great snorkeling and windsurfing. Plan to visit Haleakala Crater and Hana or take the boat trips to Lanai and Molokini. The resort is central to all these spots. Sands of Kahana welcomes you to the island of Maui and all of its beauty. The island is filled with colorful gardens and plenty of opportunities to enjoy scuba diving, fishing, sailing, and snorkeling. Sands of Kahana is oceanfront with a beach and is located a few miles north of the old whaling town of Lahaina, where you’ll find history and beauty combined in one place. Westin Ka’anapali Ocean Resort Villas enjoy stunning vistas and an exotic, idyllic setting on exclusive oceanfront property on Maui’s North Beach. From magnificent ocean views to unprecedented amenities, this resort is in harmony with Hawaii’s culture and environment. Spacious, richly appointed one- and two-bedroom villas offer generous lanais with ocean views, stone flooring and other distinctive touches that truly reflect the unique Hawaiian culture. Westin Ka’anapali Ocean Resort Villas North give you enviable access to the refreshing blue of the Pacific Ocean. Soak in breathtaking vistas of natural beauty while being able to enjoy the nearby cultural activities of Lahaina. After your idyllic days of enjoying the surrounding paradise, you’ll be welcomed home to spacious, intuitively designed vacation homes. No detail has been overlooked in the fine furnishings or in providing for virtually every need. Interval International: 5 Star Resort. Looking for Maui timeshares resales which aren’t in the list? Please let us know what you’re looking for and we’ll see what we can find!